Have you ever been truly scared of something, , , I mean really, really frightened? I have been truly scared at least once in my life, and it probably isn’t what you might think it would be. 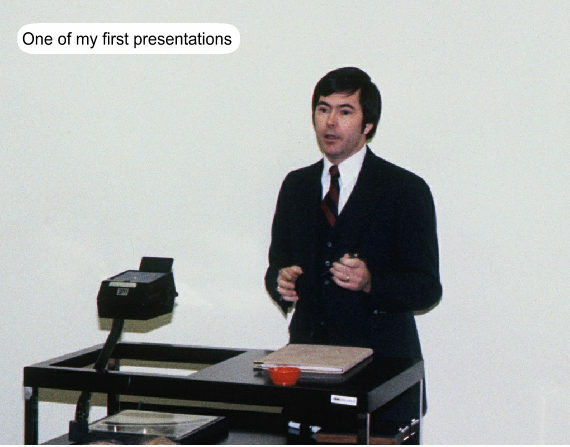 It was when I had to make my very first presentation in front of a group of people I did not know. It was a cold, snowy January day when I arrived at my first IBM class in Atlanta. I was 28 at the time and had just graduated from college, , , I was a bit older than a typical college graduate because of spending 4 years in the Marine Corps. In the class there were some 30 or so students from all parts of the US, , , we were all proud “IBM rookies” eager to make our mark in the world, , , and we were about to go through IBM’s class called A-Mod. I remember having to introduce myself to the class like everyone else did and how nervous I got as it got closer and closer for my time to speak. I would soon learn this would just be a teaser. At the end of the first day, our Instructor brings out flip chart pads and magic markers, , , then he proceeds to pass out assignment material to each of us. He returns to the front of the class and proceeds to assign us a task for the evening, , , we would learn that homework was going to be a common theme in all IBM classes. Our assignment was to develop a short, 5-minute flip chart presentation on the topic we were given. Everyone had a separate topic, , , no teamwork in this exercise. The following day we were to deliver a stand-up presentation of our topic using the flip chart bullet points we came up with. The presentation would be recorded so we could view it and our Instructors could critique them to help develop our presentation skills. Our presentations were to be graded and this is important because it leads to our final grade average, , , something our future Performance Review from our managers back home would take into consideration. 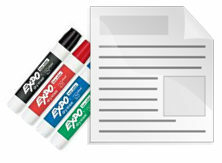 Grading would be based upon three things: content, organization of the content, and presentation delivery. I had never made a presentation to a group of people I did not know, , , never, , , and even though I was older than most in the room and a former Marine, , , I was intimidated by the whole thing. Intimidated is putting it mildly, , , I was scared. Not physically scared mind you, , , but afraid of making a mistake, looking foolish, or just generally not doing well in front of my peers, , , even though I didn’t know any of them. It’s a trait I would learn 15 years later is pretty consistent among IT people. Well, we all go to our apartments and everyone focuses on developing their presentation. 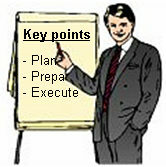 My flip charts look great and I believe I have created bullet points that capture the key points of my topic. I was totally comfortable with this part. But I’m still very much afraid of this task because of the presenting part to come, , , so much concern that I gave real thought to checking out, going to the airport, and heading home to tell my manager that I did not sign up to be a salesman. Fortunately, I didn’t go through with it. Can’t hurt that much, can it? The next day we begin making our presentations and we deliver them in alphabetical order, , , so my name beginning with an “S” means I’ll deliver mine in the afternoon. How much of the morning sessions do you think I heard? That’s right, , , none of them. Why? because I’m thinking through my presentation and analyzing every aspect of it, , , trying to remember what I need to say, etc. The closer we get to my turn, the more nervous I become. Did I mention they were going to place a microphone around our neck and record the whole thing? Are you aware of what happens when you are truly scared, , , I mean truly frightened about something? Well, your body does some strange things that I learned for the first time at this moment in my life. First, you can perspire or sweat. Your body can tremble or shake. Your voice can quiver, even come out at a higher pitch. Your heart certainly beats faster and pounds like it’s coming out of your chest. I know this to be true. But there is another thing that happens to you that I had no idea of until it occurred to me in this presentation. Your mouth gets very dry, , , cotton dry, , , dry as the desert sand. Well, when you speak, your tongue actually bounces off the roof of your mouth as you say certain words and when your mouth is cotton dry, your tongue sticks to the roof of your mouth. As you talk, your tongue gets stuck and when it releases, there is a distinct “POP“. That’s right, you will hear an intermittent “popping” sound, , , you don’t know exactly when the “POP” will occur but it definitely does. And remember, I have a microphone hanging around my neck. As I work through my presentation, I hear this “POP” from time to time and I’m sure everyone else hears it. It’s a bit unsettling, but something occurred during this ordeal, , , as I went further and further into my presentation, it all got easier and easier. My presence here today is testimony that this frightful event did not kill me, , , but it truly did scare the “bejeevies” out of me leading up to the event. I’ve been very nervous in a few other large presentations in my career, but they got easier the more I presented. Today, I can deliver a presentation to hundreds of people and I don’t get nervous, , , as long as I’m prepared and know my material. What this says is that you can overcome your fears and learn how to do things that once intimidated you. It’s all about making an investment to become what you want to become. They say the two things people are most afraid of are public speaking and death. Well, I’ve overcome the first one and so can you. Being able to present to groups is an important skill for IT managers to have so create opportunities that forces you to present to groups, , , and especially groups that are outside of your immediate network of people. Strong communication skills can help you considerably in your career, , , well worth the investment to gain them. This entry was posted in IT Manager Tips and tagged communication, first presentation, it manager, presentation skills, presenting to others. Bookmark the permalink.